It wants the tribunal, also called the World Court, to order Rwandan forces to leave the country and pay reparations. Rwanda officially withdrew in 2002 but Kinshasa says its troops are still in the country, a charge Kigali denies. In opening statements, Rwanda's deputy prosecutor general Martin Ngoga rejected the allegations, filed by DR Congo in May 2002. He said his government would not address the charges in detail, arguing that the court had no jurisdiction over the case. "A country which has suffered as much as Rwanda has done is all too aware of the enormity of the allegations made in the present case," Mr Ngoga said, referring to Rwanda's 1994 genocide. "Nor do we accept for one minute the truth of the allegations made against Rwanda in this case. "When the history of the region comes out to be written, it will bear no resemblance to what is said by Congo." 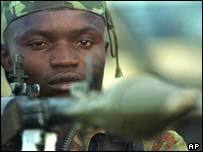 Congo's five-year civil war, which involved six countries, was declared over in 2003. But Rwanda and neighbouring Uganda are accused of continuing to fuel unrest in eastern Congo, smuggling in arms and plundering the region's resources. "Most of the claims made in the Congo's application fall outside the jurisdiction of the court in any analysis," British lawyer Christopher Greenwood, representing Rwanda, told the court. "The heart of the present case is an allegation that Rwanda is guilty of aggression. It is an allegation that Rwanda most emphatically rejects." DR Congo has filed a similar complaint against Uganda with the International Court of Justice.